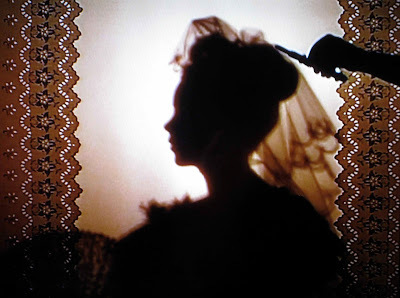 In the meantime, I’m finding it fascinating to research the origins of the silhouette. Its varied and distinguished lineage can be directly traced to the legend of the first portrait. 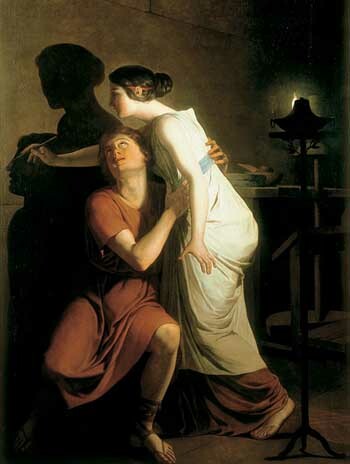 Pliny the Elder, in his Natural History (circa 77-79 AD) wrote of Dibutade, a Corinthian girl who traced her lover’s candlelit shadow on a wall before he set off on a long journey. Silhouettes have also been aligned with the black-figure vases of ancient Greece and the art of Chinese paper cutting. Silhouettes became extremely popular in the 17th and 18th centuries. 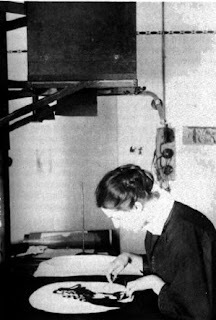 Because they were relatively quick, simple and inexpensive to make, many amateur artists, including women, enthusiastically took up silhouette portraiture. 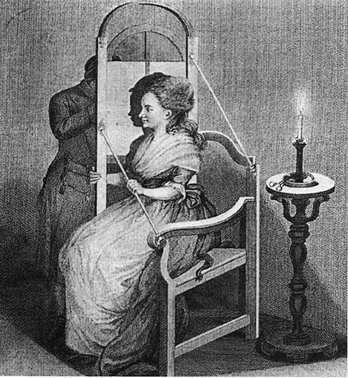 By the 19th century professional artists had patented several silhouette-tracing machines. The principal behind them was little different to the method employed by Dibutade centuries before. 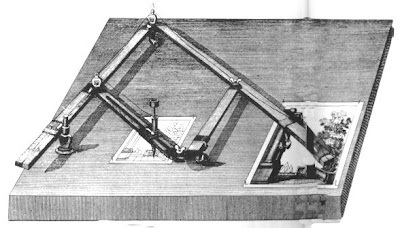 But the drawing now served as the artist’s cartoon, which was then reduced in size using an instrument called a Pantograph or ‘Stork’s Beak’. Even though professional silhouette artists were patronized by the rich and famous, their clients were equally immigrants who, in the days before the invention of photography, recognized a quick and economical way of commissioning a likeness to send to loved-ones in their homelands. Recently I acquired a DVD copy of Vincente Minnelli's movie The Pirate (1948) a film I've long admired. Minnelli is an extraordinary colourist with an incredible eye for detail, for example the brief sequence where Judy Garland as Manuela sits for a silhouette portrait prior to her wedding. Silhouettes were originally referred to as ‘l’art d’ombre’ (shadow art) in France and ‘shades’ or ‘profiles’ in Britain. The art was re-named for Étienne de Silhouette, a French Economist, who, as Finance Minister during the Seven Years War (1756-63) imposed severe economic measures on the populace – particularly the wealthy. Consequently his name was applied derogatively to practically anything that was done on the cheap. In this instance, the name has stuck, but fortunately its original negative connotation hasn’t. All acrylic on canvas, 9 x 7 cm. Photographs by Tim Gresham. I've just completed another work for Vignette/Vitrine. In my last post I mentioned that I believe a great curatorial theme can potentially revitalise an artist's work, as curator Megan Herring's has done for mine. Firebrand, the unique edition book pictured above, is an experiment of sorts, and like the works previewed last week, evolved directly from this project. It's already become evident that it will be a springboard for more books; in fact I've already started to map some of them out. 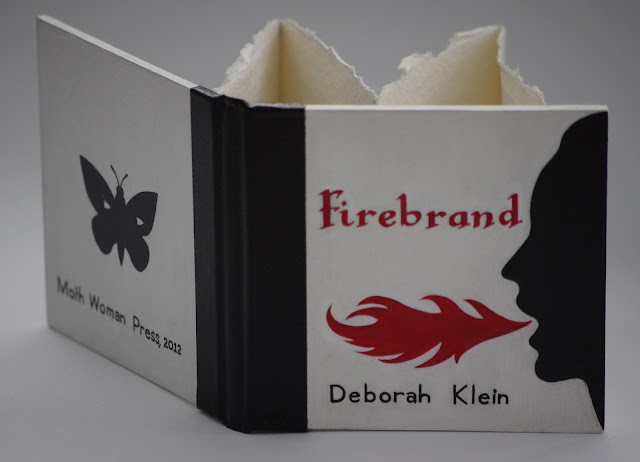 To see inside the covers of Firebrand, visit Moth Woman Press artist's books and zines HERE. The exhibition opening at Hand Held Gallery is from 6-8 pm on Thursday 20 September (see below). For those in Melbourne, I hope you can join us, or that you'll be able drop in during the show's run. For full details, scroll down to the end of my previous post. Pictured top: Firebrand, 2012, unique concertina book, pigmented ink, acrylic paint, Khadi paper, gessoed mdf and bookbinding tape, 8.5 x 9 cm (closed); 8.5 x 45 cm (open). Photograph by Shane Jones. I have some new work in the forthcoming group exhibition Vignette/Vitrine at Hand Held Gallery, Melbourne. Curated by Hand Held Director Megan Herring, the exhibition will comprise paintings, objects and works on paper. Other participating artists are Sheridan Jones, Paul Compton, Bonnie Hanlon, Priscilla Ambrosini and Megan Herring. The miniatures encased in the wooden box pictured above are my first forays into silhouette figures. Traditionally, silhouette portraits are black paper cutouts, sometimes with selected details added in white. The painted surfaces of my works deliberately emulate these effects. Over the years I’ve found curated projects such as this one to be exceptionally challenging and stimulating. Seeking fresh ways to address a specific brief, at least if it’s one that particularly excites my imagination, will almost invariably introduce new life and direction to my work. In fact, I’ve continued to extend and develop the silhouetted figures, and plan to take them to a larger scale. 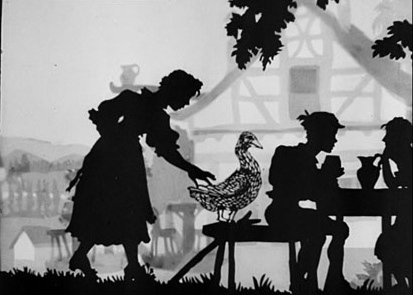 The shadow animations of Lotte Reiniger are the primary influence for this series. As a young child, I discovered her animated fairy tales on black and white television. I was completely captivated - I had never seen anything quite so magical before - and never forgot them, although I had no idea who their creator was. 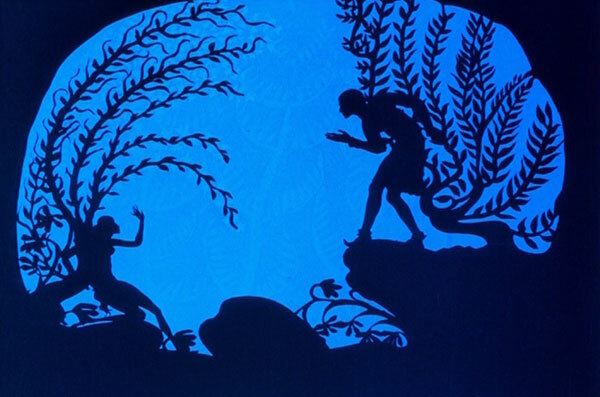 The mystery was finally solved in 2010 when I attended a special screening at Melbourne’s Astor Theatre of Lotte Reiniger's The Adventures of Prince Achmed (1926) the world’s first extant full-length animated film. I wondered if this could be the same artist whose fairytale animations had stayed with me for all those years. Indeed she was. 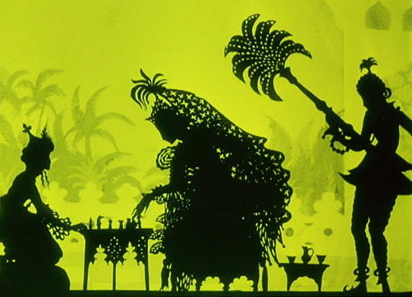 The Adventures of Prince Achmed, an acknowledged masterpiece, is now firmly entrenched near the top of my list of favourite films. I have my very own DVD copy, courtesy of the British Film Institute, and, thanks also to the BFI, can also regularly revisit Reiniger’s short fairytale subjects that I first encountered in childhood. When researching her work, I was elated to learn that she shared my admiration of the work of film pioneer Georges Méliès, and that Jean Renoir, another of my cinematic heroes, was a lifelong enthusiast and supporter of her work. The exhibition will run from 20 September - 20 October. 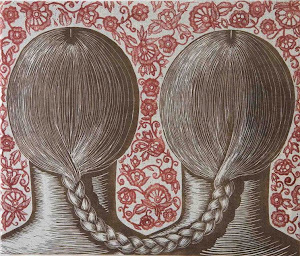 My linocut Lace Face/Lace Wraith, 1997, is part of the current exhibition Sentinels and showboats – milestones in print collecting at Geelong Gallery. The exhibition aims to reflect the range and inventiveness of the works that have been acquired through the prestigious Geelong Print Acquisitive Award. Lace Face/Lace Wraith was a recipient of the Award in 1997. It was one of the final works that I completed whilst undertaking a Master of Arts (Research) Degree at Monash University in 1995-97. The motif of the tattoo, which I had explored via the Tattooed Faces and Figures series (1995-97) became ultimately a device through which to incorporate women’s sewing iconography as a signifier of women’s hidden histories. As an extension of this, I began to print onto fabric, then layer and hand stitch the imagery. 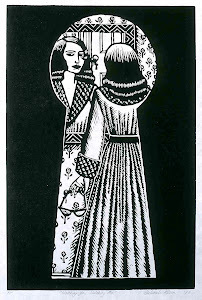 At first I experimented with pre-exisiting blocks, beginning with the linocut Lace Face, 1996 (the basis for this work) before progressing to new linocuts designed specifically for printing onto fabric. The first of these was The Lair of the Lyrebird, 1997. To see this and other works on fabric, click HERE. Lace Face/Lace Wraith reflects my ongoing fascination with the notion of the double - in this instance, the haunted double. In Scottish dialect, a wraith is a spectre or apparition of a living person; it is also regarded as a portent or omen. Other featured artists in Sentinels and showboats include Heather Shimmen, Rona Green, Tate Adams, Raymond Arnold, George Baldessin, John Ryrie and Pat Brassington. The exhibition continues until September 9.